Adly, a startup that connects advertisers with celebrities willing to post promoted messages on social networks, recently raised $2 million in additional funding. The new funding came from previous backer GRP Partners and new investor Siemer Ventures. Adly has now raised a total of $7.5 million. The company also launched a new product this week. It’s the first thing you’ll see if you go to the Adly website — a button that says “Match Me Up!” which allows Adly to analyze a business’ existing content and followers, then find publishers who are a good match to “amplify” their content. For example, when I signed in with my personal Twitter account, Adly said it found six celebrity publishers who, collectively, could increase my reach 61x and my engagement 31x. 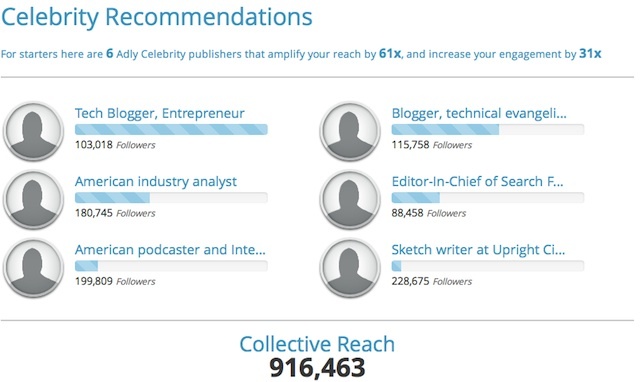 They include a blogger/entrepreneur with 103,000 followers, an analyst with 180,000 followers, and a podcaster with 199,000 followers. (I also tried to analyze TechCrunch’s account, but we have too many followers.) Who are these people? Well, you don’t actually get to find out until you actually start a campaign with Adly. Walter Delph, who became Adly’s CEO a little more than a year ago, said this is part of his larger strategy. One of Adly’s big selling points is the fact that advertisers aren’t just getting access to a lot of eyeballs. By enlisting celebrity endorsers, they’re hopefully prompting lots of conversation and engagement, i.e. reach that’s “earned” rather than paid for. The company’s next step is building more tools to ensure that the conversation and engagement is happening. By the way, even though Adly is known as a celebrity endorsement network, it’s actually broader than that. The company has relationships with 75,000 influencers, and Delph estimated that only about 2,000 of them are celebrities in the traditional sense — “By celebrity, what I mean is, if you walked down the street you would recognize them.” The other 73,000 aren’t at that level, but they have influence that’s valuable to advertisers (at least when it comes to certain topics).